My Own Square Inch of Alaska. Sharon Short. Penguin Group (USA). January 2013. 336 pp. hbk. ISBN #: 9780452298767. Donna Lane is a young girl with a vivid dream of becoming a notable designer, a field she ardently loves. Yet she also feels bound to stay home in a small Ohio town with her father, who seems oblivious to everything and everyone and her brother, Will. All seems relatively normal aside from living without the guiding hand of a loving mother. Will is obsessed with a TV Show focusing on its hero, Sergeant Striker, and is determined to collect enough cereal box tops to win ownership of “one square inch of Alaska” and a trip there with his hero. Life has other plans in a sense. Will becomes very, very ill. Donna is determined for him to have his one big wish granted but finds out that the Alaska game is a big fat scam. 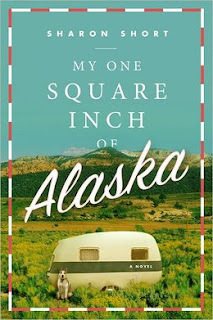 However, that doesn’t deter her and she decides to take Will to Alaska and get him his one square inch. The rest of the novel is about their harrowing trip where strangers assist them after falling in love with their dream wish, all of this as Will is becoming weaker and weaker. An ordinary tale told with extraordinary skill, My Own Square Inch of Alaska is about the special qualities of a brother-sister relationship. It’s also about the hope that must endure no matter what devastating realities occur, whether that be the disappointments from crooked liars who promise large and deliver small or nothing or from the battle between hope and despair in the face of terminal illness – the fact that one is not dying but is fully living until one dies – a phenomenon we often forget applies to all. Tenderly and humorously told, this is a novel to be cherished by all readers who love any genre! Well done, Ms. Short!